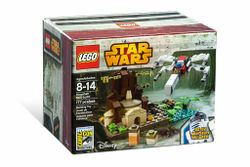 The Dagobah Mini-build is a Star Wars: Episode V The Empire Strikes Back set sold during the 2015 San Diego Comic-Con International. 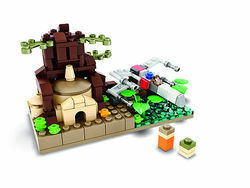 The set will contain a mini model featuring Luke Skywalker's crashed X-wing and Yoda's hut. Square 1x1 plates are also used to depict mini versions of Luke Skywalker and Yoda, and a 1x1 stud to represent R2-D2 plugged into the X-wing. An R2-D2 minifigure is also included. This page was last edited on 18 August 2017, at 01:06.